Should I DIY or Hire a Roofer? Doing it yourself is often a rewarding experience when it comes to baking, crafts with the kids, and decorating a holiday table to dazzle your guests as they come for Thanksgiving dinner. However, this do it yourself (DIY) mentality should be limited when it comes to certain areas of expertise, due to the fact that it has the person’s best interest in mind. Websites, bloggers, and those who dwell on YouTube try to make certain tasks appear to be easy in nature when, in reality, they are quite difficult to execute when somebody does not have the knowledge of doing this particular project. Appointing a spotter. Who is holding the ladder and keeping a general eye on you? Did you let someone know that you would be on the roof to begin with? It is not a job that is best kept secret, after all. What tools are really the right tools to use? Did the person filming the tutorial video take into consideration that everyone’s house is different, and that diving right into a project without any knowledge is consequential at best? Is the weather going to be alright during your stay on the roof; how was it the past few days? The rain the day before could make the roof entirely unsafe to be on, and you are not a professional. What if there is an injury; do you know what to do? Professional roofers have undergone training before starting their careers. They understand what could pose a problem, the necessary steps to take before starting a job, and what to do in case of an emergency. Climbing on a roof seems simple in hindsight. You only have to be careful, right? Well, often times being careful is not as easy as it looks, and those who lack experience do not have the necessary reflexes to remain stationed on the roof for long periods of time. Additionally, embarking on a new task results in paying attention to the job itself, rather than your surroundings. OSHA reports over 359 out of 899 total deaths that resulted from roofing falls as of 2014. If professionals fall victim to unsightly slips and falls, why would your situation be any different? Roofing Newnan in Ga are businesses full of professionals with decades worth of experience. Not only do these pros understand how to prevent falls and general injuries, but they have worked on homes of all different styles; they have seen the trends that swept every generation; they know what has always worked and what has never worked within the industry. Technically speaking, of course, why would you want your home to be a temporary fix for your DIY experimentation? Professional roofers have proven their knowledge of the task through actually completing multiple roofs successfully, and have undergone the necessary training that earned them their title as well as their position deservingly on top of a roof. When you are inexperienced, a certain project takes you longer to complete, due to the fact that you are just learning the trade. Chances are, your closest friends are also not roofers because they would have urged you to hire professionals if they heard about your current project, so you are more than likely embarking on this job yourself. As you place each shingle, you might gain a little speed, but it will surely still take longer than hiring a professional would. A professional’s two-day job becomes your two-week task, and that is simply not enjoyable for you as a homeowner, and leaves room for more potential errors to occur over a long period of time. Plus, the difference in quality is, unfortunately, noticeable. Experience equates to quality, after all. Failure to install starter shingles along the eaves of the roof–ultimately allowing water to later invade the space. Choosing materials that do not match the general slope of the roof. This also allows for water penetration to damage the roof and leave it susceptible to leaks. The portion of the roof where water collects the most are referred to as valleys. When roofing, many forget to properly secure this portion of the roof, making leaks inevitable. Most of the world lives in a cold climate, but DIY tutorials on roofing fail to take that into consideration by not educating their viewers on ice dams. Preparing for ice dams (where the freezing temperatures force water under improperly insulated roofs) is a difficult task best left to the professionals. Not aligning the shingles correctly is common for those who are unprofessional. This is very noticeable, and a key sign that somebody is a DIYer. Shingle exposure is the space necessary between shingles. It varies among roofs, and the failure to space shingles correctly makes them prone to moisture damage. Metal roofs: Costly, but practical in the long-run, and very difficult to install. White roofs: These roofs are only white from a bird’s eye view, but were designed to reduce the Urban Heat Island Effect. Slate roofs: Again, costly in the short-term, but energy efficient overall. Professionals with extensive experience within the industry understand that trends come and go. While certain trends prove to be long lasting, that is rarely the case, and they are rarely practical. If your home is unable to withstand the installation of a certain roofing material, roofers will tell you that. Roofers are not salesmen and refuse to place their name on a shoddy job, so it is safe to say that you can always expect honesty from these contractors. By now, you probably have an understanding that those skilled in this career deliver quality work and proper installation. Most DIY tutorials only clue viewers into the basics, including how to place shingles, what tools to use, and what will make your house appear attractive to the public. However, these tutorials do not educate the viewer as to what will probably go wrong, and fail to mention that roofing is not a hobby, per se. Essentially, taking matters into your own hands when it comes to roofing might deliver decent results, but would never deliver quality work as a result of the perfect installation. As previously mentioned, the installation of a roof requires plenty of planning and an understanding of what needs to be considered and, eventually, accomplished. The shingles must be evenly spaced; those with experience are able to detect misplaced shingles a mile away. The annual weather is always a consideration for professionals, but DIY tutorials could not possibly educate a diverse audience on what their area has to offer. To finalize, there are profound reasons why certain careers are referred to as professions. DIY as a trend works well for small projects and crafts, but roofing is no easy feat, and deserves to be performed by those with training and experience. The failure to invest in quality experts could have detrimental consequences for your roof, and you would be surprised how noticeable certain mistakes are in this circumstance. 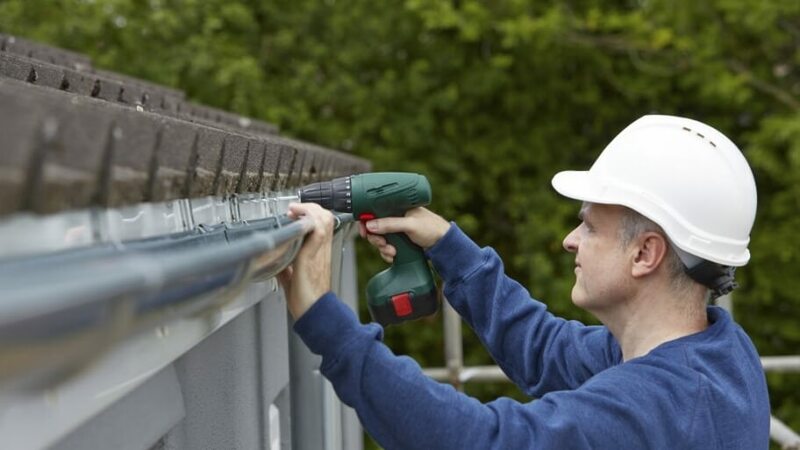 Roofers do not only improve the appearance of the home, but they guarantee its overall safety by avoiding the risk of potential leaks and collapses. From this article, you can undoubtedly understand that professionals are available for a reason, and that a lot more could go wrong than misplaced shingles when you decide to begin roofing on your own. Whether they learned through experience or were taught through an apprenticeship, roofers have the necessary skill to protect homes. If you are in need of a change or repair, contact your local expert for roofing Newnan in GA immediately. Leave the tutorials for crafts with the kids, a new recipe, or sprucing up the bathroom. ← Do I Need a New Roof?